We offer a lot of quality products here at Wholesale Siding Depot, but we’re always on the lookout for additional home building products to add to our available inventory. We carefully scrutinize new products before offering them to our customers to ensure they meet our high standards for quality and value. That’s why we’re pleased to announce the newest addition to our lineup of decking materials: Fortress Infinity Decking! In previewing this product prior to adding it to our inventory, we were extremely impressed with both its vibrant range of available colors and its durability: Fortress utilizes a proprietary extrusion process that combines high-density bamboo with a composite plastic material. The result is a decking product with an extremely high degree of durability. 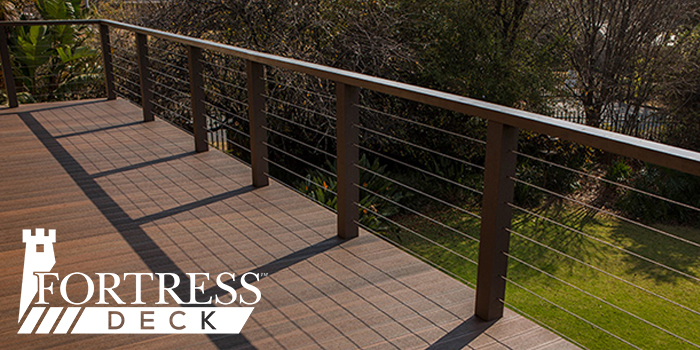 Additionally, Fortress Infinity Decking is made with a patented 360-degree wrap that completely protects the product from water and mold on all sides. During its design, Fortress Infinity Decking was field tested at sites that were in some of the harshest climates in the world. The result: a decking product that is as durable as it is beautiful, and one that is engineered to exceed industry standards. Wholesale Siding Depot is proud to now offer Fortress Infinity Decking. Take a look at our product page to learn more, or stop by our showroom to see a sample first-hand!